Stadler won the tender to develop and build 40 trams for the Dopravní podnik Ostrava a.s. (DPO) operating company in Ostrava. The order is worth a total of approximately CHF 45 million. The Ostrava trams are being planned and constructed by Stadler Prague. Stadler will work closely with Czech suppliers. This is the first time that Stadler has received an order for trams from the Czech Republic. Daniel Morys, Executive Director of Dopravní podnik Ostrava a.s., and Peter Jenelten, Executive Vice President Marketing & Sales at Stadler, signed the contract for the delivery of 40 adapted Tango trams. The contract between DPO and Stadler covers the delivery of 30 + 10 2-car low-floor uni-directional trams for normal gauges. The order is worth a total of approximately CHF 45 million. The trams are based on the tried-and-tested Tango design, but have been tailored to DPO requirements in Ostrava with low-floor technology and other customised adaptations to fit their unique intended purpose. Stadler Praha is overseeing project planning and engineering. The 2-car trams for the city of Ostrava are 24.9 metres long, 2.5 metres wide, and 3.6 metres high. They offer space for up to 188 passengers, with seats for 61. The vehicles have low floors throughout, and also feature four wide doors for quick and efficient boarding and disembarking, as well as a wheelchair ramp. The vehicles are fully air-conditioned and have a maximum speed of 80 km/h. They meet all the relevant safety standards and the front of the trams is optimised for pedestrian safety. The electric trams from Stadler represent a particularly attractive investment thanks to their proven design, low overall system costs and reliability. They are approved by a wide range of European countries and can be found operating in a number of different configurations in countries including Switzerland, Germany, France and Denmark, with Russia soon to join the roster as well. The first tram for Ostrava will be in the final assembly phase in March 2018. 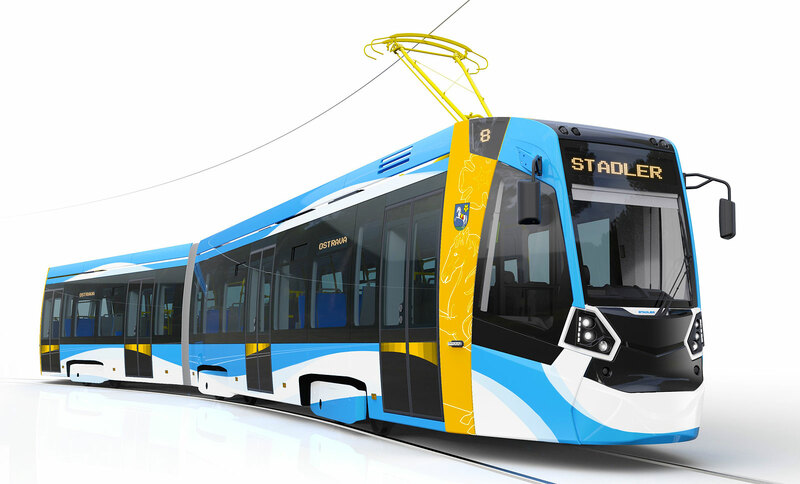 Railcolor: remarkable is that the exterior design of the Tango trams from this order, is very similar to the Metelitsa design, a type of LRV that will be built for St. Petersburg.